A trip to the Chicago area turns into an elegant excursion when you book a stay at Stone Terrace Bed & Breakfast in Evanston, Illinois. The historic mansion is a quiet oasis, yet convenient to many of the sights of the city. and a grand library featuring a stone fireplace and book collection. A lower lever features a media theater, billiard room, fitness room, and massage room. The outside terrace provides more restful space. Guests at Stone Terrace can choose from five elegant guest rooms with heated marble floors, luxurious linens, plush robes, and televisions neatly hidden behind mirrored vanities. (Shown: Florence Walrath Suite) Amenities—which vary from room to room—include fireplaces, soaking tubs, walk-in showers, and lakefront views. Delicious gourmet breakfasts are served daily in either the formal dining room or more casual morning room. Each of the guest rooms is named for a notable Evanston women, so beginning this month, the B&B is hosting a special Tour and Tea with the Ladies of Stone Terrace that offers insights into the women and tours of the rooms, followed by tea and refreshments. Whether guests are coming to visit nearby Northwestern University, explore Chicago, or traveling for business, Stone Terrace B&B provides a wonderful blend of pampering and convenience, elegance and comfort. It is indeed a special place. Stone Terrace Bed & Breakfast is a member of the Illinois Bed and Breakfast Association … a unique lodging experience! Photos courtesy of Stone Terrace Bed & Breakfast. 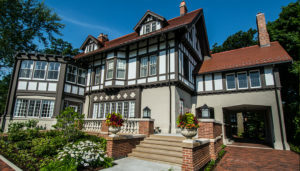 This entry was posted in Illinois Bed and Breakfasts, Touring Illinois and tagged Chicago area attraction, Illinois Bed & Breakfasts, Romantic getaways by admin. Bookmark the permalink.